Since 1903, the Southern Illinois Symphony Orchestra (SISO), composed of faculty and students of Southern Illinois University Carbondale (SIUC), talented community members and area professionals, has brought outstanding music to Southern Illinois. In 1997, a Patrons Committee of prominent members of the community formed to raise funds and promote the orchestra as a community resource. Thus SISO serves all of southern Illinois with its component of community amateur and professional musicians, and its broad impact upon the cultural climate of the region. In January 2001, the Illinois Council of Orchestras named SISO the Community Volunteer Orchestra of the Year in Illinois, and awarded it a Certificate of Recognition of Meritorious Programming for the 2001-2002 season. In January 2005, the Council named Music Director, Edward Benyas, Conductor of the Year in the Small Orchestra category. In 2007, Maestro Benyas received the “Keeping the Arts in Business” Award from the Carbondale Chamber of Commerce. WSIU television and radio have been valued partners with the Southern Illinois Symphony, broadcasting important performances, on local radio and television over the past half decade. Two significant recent events were the arrival in 1994 of Music Director, Edward Benyas, and the establishment in 1997 of the Southern Illinois Symphony Orchestra Patrons Committee. The 45-member Patrons Committee volunteers their time year-round to promote the orchestra season, raise operating funds through corporate and individual contributions, sell program ads, increase the scholarship endowment, host pre-concert dinners, post-concert receptions and an annual benefit dinner and silent auction. Some of the musical highlights since Mr. Benyas' arrival include: An appearance on national television (C-SPAN) during the funeral of the late Senator Paul Simon in 2003; performing for President Clinton, a bevy of state and local dignitaries and an audience of 10,000 in 1995; All-American music programs for Presidents' Day, Election Day, Black History month, Veterans' Day, Copland's 100th Birthday, and the Pearl Harbor 60th Anniversary; annual concerts for school children; "Six Tenors and More!" in 2000; the first Southern Illinois performance of Beethoven’s 9th Symphony with a 100-voice chorus in 2001; a world premiere in 2009 of a work by Jim Stephenson commissioned by a consortium of orchestras, organized by the SISO; and the production and release of several compact discs. In Fall 2004, SISO established Klassics for Kids. 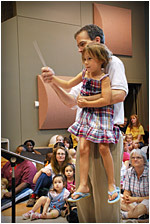 This monthly concert series helps expose infants and toddlers to live classical music and jazz. Parents and Caregivers are encouraged to help youngsters develop skills appropriate for a live performance in a somewhat informal atmosphere. In Summer 2005, the SISO established a three-week long professional music festival, running from mid-June through the Fourth of July. The Festival annually includes over three-dozen performances, the majority of which are admission free, with a world-class festival orchestra and internationally recognized soloists. Concerts include orchestral and chamber music, opera, ballet, musical theater and jazz, and stretch across Southern Illinois from Mt. Vernon to Cairo. 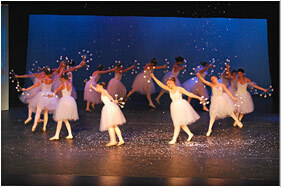 The 2009 Festival will reach the state borders near St. Louis and Cape Girardeau. Each year, SISO engages Illinois solo artists, accompanies local chorus and opera companies; provides performance opportunities for Illinois guest conductors and composers, and hosts an annual student Solo Competition. 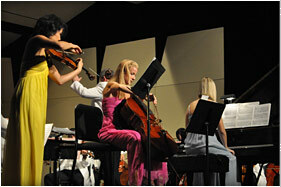 In addition, SISO performs educational concerts several times each season for youngsters throughout the region. For each performance, SISO engages on average one dozen professional Illinois musicians. SISO is the only regional symphonic orchestra to serve the southern Illinois counties of Jackson, Williamson, Union, Johnson, Alexander, Pulaski, Massac, Pope, Saline, Hamilton, Franklin, Jefferson, Perry, Randolph and Washington.